This beautiful princess doesn’t have a kingdom but she does have a pony called Pretty, a cart and a red umbrella. She earns a little money by taking awkward parcels in her cart that won’t go in the post “things like ostrich eggs that are about to hatch or troublesome things like lame dogs or unruly grannies”. Everywhere she goes she’s on the lookout for her kingdom. Numerous princes, and even a king, fight each other with buns and gateaux to offer her theirs, but the beautiful princess has no time for them. It is the Jester, who gives her his heart, who helps her to find her kingdom at last. This is a modern fairytale with enchanting illustrations by Sarah Gibb. … enter the rococo Neverland of poor-but-deserving princesses searching for Mr Right among assorted prince Wrongs,…. do it with the skill and aplomb of Ursula Jones and Sarah Gibb. Such outstanding prettiness with substance is rare. 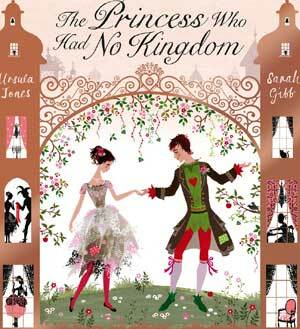 There is plenty in this story to raise a giggle (including a silly bun fight between the princess’s potential suitors). Essentially though, the Princess Who Had No Kingdom is a charming, modern-day fairytale and a truly satisfying story. The text is complemented perfectly by Sarah Gibb’s exquisite illustrations that use silhouettes to create a magic, fairytale atmosphere. An ideal book to read together with children. Sarah Gibb’s illustrations suit the tone of the book perfectly. Both story and pictures exude good-humoured charm. A very modern story in terms of it’s language and quirky asides which give some sharp digs at upper class snobbery, this is still at heart a happy-ending fairytale which offers hope to all wannabe princesses that they too may someday find their handsome prince, even if he doesn’t come with a crown or a ready supply of gold.